When improvising, it’s important to know which scale(s) to use. 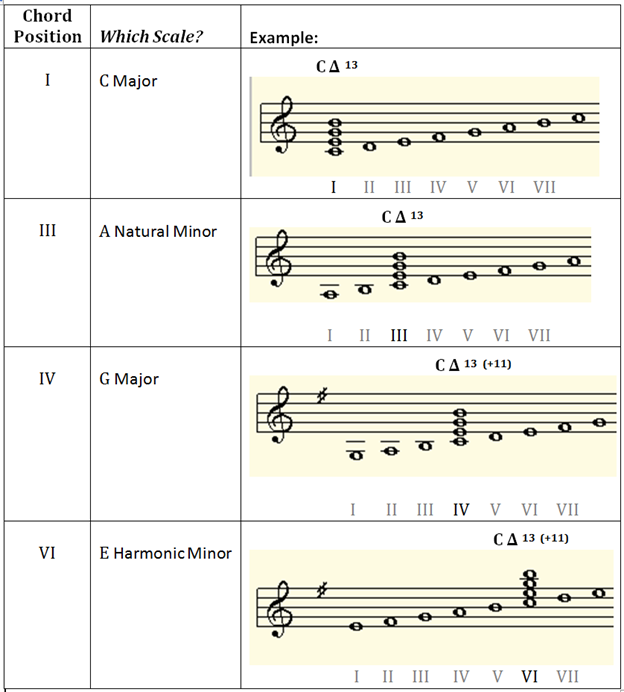 Traditional music usually has one scale for the entire song (or section). When the song modulates (changes key), the scales used are also changed. Jazz improvisers use any scale they feel sounds best. You still cannot violate the “laws of harmony” – there’s simply more freedom in selecting compatible notes from alternative scales. ONLY TWO SCALES: While there are four (4) scales listed, there are really only two (2) scale choices. USE YOUR EAR! Regardless of “proper key” – do you like the sound of the augmented 11th? (Only found in two of the scales). THE “OTHER NOTES”: What to do with the “other notes” not found in the (above) scales? PASSING TONES: The “other notes” allow you to move (transition) among the notes within your chosen scale. When the “other tone” is sharp (#) it usually moves- up to the next scale note. When the “other tone” is flat (I ) it usually moves-down to the next scale note. USE YOUR EAR! Please do try breaking the (above) ancient “passing tones” rule. However, you’ll quickly discover “passing tones” really do sound better when their next move is to a scale note. This entry was posted in Chord Theory, Harmony, Improvisation, Jazz. Bookmark the permalink. 2 Responses to MAJOR 7 CHORDS: Which Scales Go with Which Chords?